Do they have a fabric softener line available, or shaving cream ? I'm sure that there's a line of styling oils and skin creams for the modern jihadi who wants to make himself more presentable when he appears before Allah. Very funny, Baron. 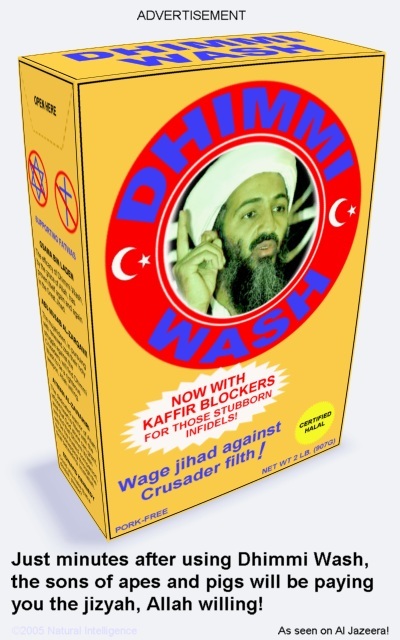 Maybe you could get Demi Moore , er I mean Dhimmi More, to endorse it and Jonathan Demme (or is that Dhimmi?) to shoot the commercial. The box forgot to mention dogs. Give Me Hilarity or Give Me Death! Yes, Dallas, It's "Texas Pulled Pork Bar-b-q"
A Symposium: After Hizbullah, What? An Unfortunate Choice of Words?